There's a decent amount of treasure, but the one that you must find is the North Ship Key. Without that, you won't be able to reach the Tower of Mirrors. There are a lot of places in here where it looks like you can't get through, but you can actually walk below the building walls even in places where you can't see a visible path. In the upstairs room, there's a puzzle you need to solve. Basically you need to re-arrange the tiles until you get a picture of Blont's face. This is adapted from the solution offered on the Japanese Tenmilli wiki. Look at the puzzle as a grid with 9 squares. To solve the puzzle you need to move each part of the picture into its proper position. Once you solve the puzzle, tile #3 will automatically fill in, and the door to the other side of this room will open. Take the stairs down to get the North Ship Key. Now there's still more treasure, and another dungeon to explore. First, go to the Weapon Shop and go through the door in the south. Now walk between the Weapon Shop and the Inn, then follow the path to the building in the northeast. There's a healing fountain mixed in among the flowers here, and stairs down to a basement dungeon. In this part of the dungeon, there's a locked door that can only be opened from the other side, so just get the treasure here then go back up the stairs. Now head for the building in the northwest. 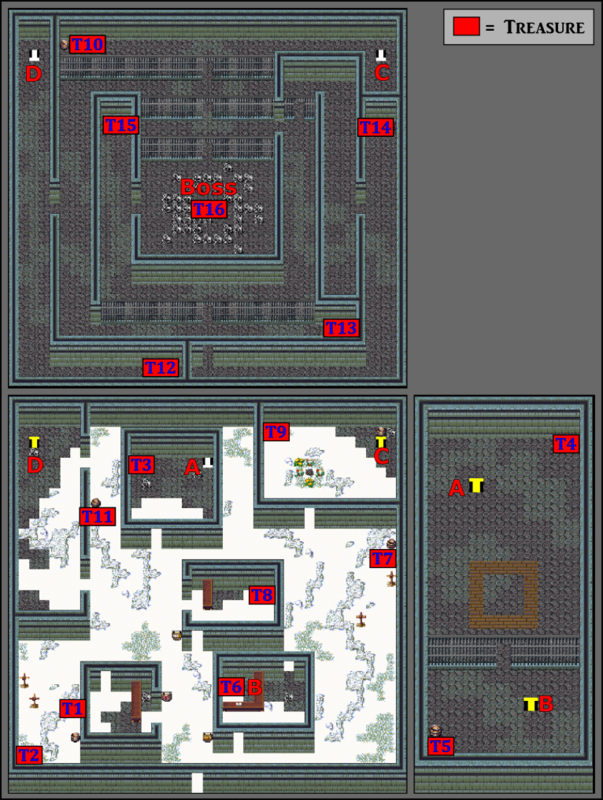 To get there, you can either go through the Inn or the Weapon Shop, then go around the top of the building that leads up to the dungeon with the puzzle. Take stairs D down to the basement, gather the treasure, then go to the center of the room for a boss battle. Each one of these bosses use AOE attacks, so you can either attack them all at once, or one at a time. Either way you're gonna take a beating. I had Zilva, Linn, Midori, Blont and Mazenda in my party, and cycled between regular attacks and all out attacks (and used Mazenda primarily as a healer). After this battle you get the treasure - a Phantom Helmet. Now you're all done here, so exit to the World Map and go north to find the boat, then sail around until you're north of the Tower of Mirrors.